This is the most effective method we have found. *That is, as long as you can safely reach your roof with a roof rake WITHOUT getting on a tall ladder. Whatever you do please stay off your roof. That means NO snow blowers on your roof! It truly alarms me how many homeowners have actually attempted this! I didn’t even believe it until I saw actual footage of someone doing it! Crazy! 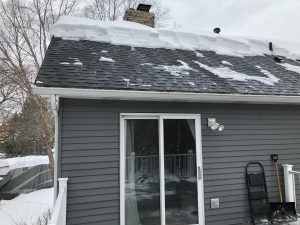 My brother-in-law had been trying to remove ice dams on his roof with ice dam remover pucks with no success. They were more of a pain than anything because after a couple of days they would slide right off the ice and onto the ground without even accomplishing much melting. He had been admiring how perfectly clean his neighbor’s driveway and roof was (if you live in the Minneapolis area you understand how rare a ‘clean’ driveway is right now!) so he finally asked him what he used. His neighbor said he had tried it all and that Sodium Chloride works the best. 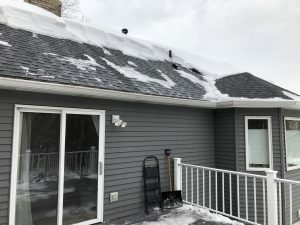 Not only does it seem to be more effective than other snow salts on the market, but it is also far less evasive on your roof, cement, and asphalt. The technique is a little different than I ever would have thought of myself but super effective! Watch this youtube video we found. How easy is that?! 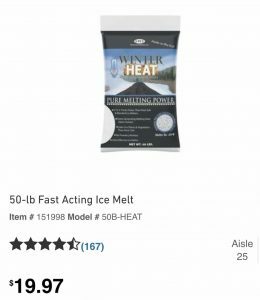 You can google ‘sock method for thawing ice dams’ and a ton of info will pop up. I will be keeping a couple of bags of sodium chloride handy every winter from now on! 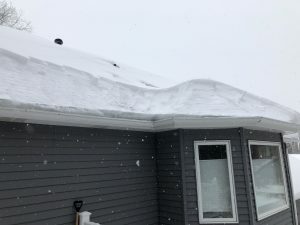 Check out these before and after pictures of my Brother-n-Law’s ice dams. If your home or business is experiencing water damage due to an ice dam or any other source, Call 24Restore! Our highly trained team is here to help 24 hours a day! NO job is too big or too small, and we are the only call you have to make.